“No,” answered Aldrin tersely. “OK, I’ll get it when I get up there,” Armstrong replied. After a brief pause, Aldrin asked “Want it now?” and Armstrong answered “Guess so”. Another pause and then Armstrong asked “OK?” and Aldrin answered “OK”. Nothing more was said about the “package”. The conversation can be heard in the TV broadcast of the moonwalk, for example at 15:21 from the beginning of this video taken from the documentary Moonscape. Figure 13.4-1. From 15:21 onward, the live TV broadcast of the exchange between Aldrin and Armstrong. and a small silicon disk that contained written messages from several heads of state from all over the world and other data. Figure 13.4-2. A gold olive branch similar to the one left on the Moon by the Apollo 11 crew. Detail of NASA photo S69-40941. This was the official content list of the package, as reported in NASA press release 69-83F on July 13, 1969. But there were also other politically very sensitive items: two Soviet medals, one in honor of cosmonaut Vladimir Komarov, who had died at the end of his Soyuz 1 flight due to parachute failure, and one for Yuri Gagarin, the first man to orbit the Earth, who had perished in a plane crash in 1968. This was a gesture of chivalry among spacefarers that at the time of the Cold War, when the Soviet Union was seen as a deadly enemy, might not have been appreciated by many and therefore was kept confidential during the global television broadcast, although it was not held strictly secret, as it was mentioned in a public statement by then president Nixon on the day of the Apollo 11 liftoff from Earth. * Statement about Honoring American and Russian Space Heroes During the Apollo 11 Mission, July 17, 1969, also published in Public Papers of the Presidents of the United States: Richard M. Nixon, 1969, United States Government Printing office (1971). This gesture was followed by another discreet international tribute during Apollo 15, which left on the Moon a plaque dedicated to the American and Russian astronauts who were known to have died (Bassett, Belyayev, Chaffee, Dobrovolsky, Freeman, Gagarin, Givens, Grissom, Komarov, Patsayev, See, Volkov, White and Williams) and a small statue, the Fallen Astronaut (Figure 13.4-3). Figure 13.4-3. 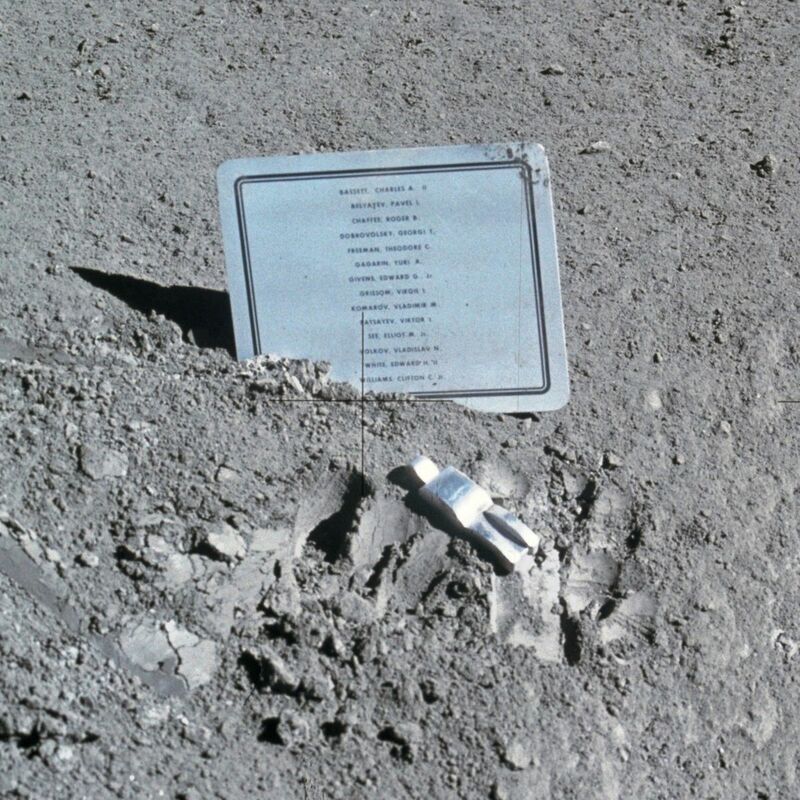 The Fallen Astronaut sculpture and the commemorative plaque, placed and photographed on the Moon by the Apollo 15 astronauts. The statue and the plaque were taken secretly to the Moon by David Scott and were placed on the lunar surface, without mentioning them on the radio, during one of the moonwalks. Their presence was disclosed only when the Apollo 15 astronauts returned to Earth.